MSM is essential in Collagen & Keratin production that helps in skin strengthening. Beauty Mineral MSM cleans, detoxify & brightens your skin that makes you look young. Treats Acne & wrinkles effectively. MSM Pure Soap Bar contains MSM as main ingredient. MSM is the purest form of bioactive organic sulfur. It is also known as Nature’s Beauty Mineral. 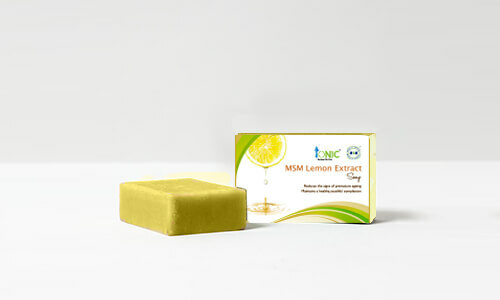 MSM Pure Soap Bar removes skin dryness, while making it smooth, supple and healthy. It also brightens up your skin, improving its overall texture. MSM Pure Soap Bar is much more than a regular soap bar! MSM Glycerin Soap Bar contains the magical benefits of MSM and glycerine. MSM Glycerin Soap Bar contains the skin curing and anti-aging effects of MSM and anti-aging, conditioning, exfoliating and moisturizing effects of glycerine. MSM Glycerin Soap Bar is a wonderful formulation brought to you by Ionic MSM India Ltd. Try MSM Glycerin Soap Bar only once, we are sure you never touch any other soap bar again! 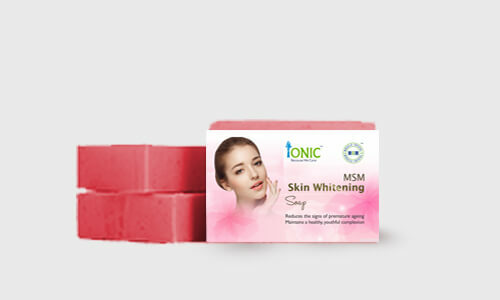 MSM soap is benecial for reducing the sign of premature aging. The lemon extract lightens dark spots on your skin, lightens skin complexion, treatsoilycomplexion, and moisturizes your skin after use. The essential sage oil aids in suppressing cracks, scars, and other unwanted marks on the skin. The polyphenols present in aloe vera can help to inhibit the growth of bacteria that can cause infections and inammation. 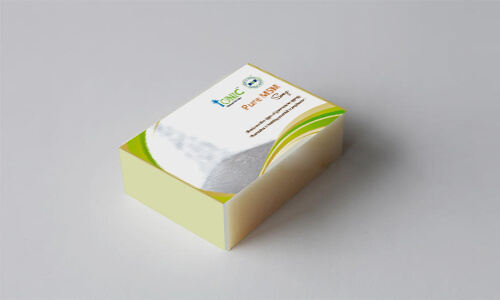 The soap cleanses and softens the skin without clogging pores, working as a natural moisturizer. MSM (methylsulfonylmethane) is an organic sulfur-containing compound which is exceptionally effective and useful to improve immune function and help to restore healthy bodily tissue. The main reason that many benefits and advantages are attributed to the MSM supplement is that it provides active sulfur, the 3rd most plentiful mineral of the body, needed for many different critical functions at every single day. By using MSM Whitening Soap Bar we can hold on to collagen and keratin as sulfur is the most important component for the production of these “youthful” elements. By losing collagen, the healthy tissue gets older through which our skin tone and elasticity suffer. It helps in reducing allergies and makes skin glow. It helps in removing itchiness of skin by easing sensitivity. The tissues of dark spots and skin damaged by scorching sun ray revived. As collagen helps skin from becoming cracked, dry or soggy, MSM of the soap bar helps in collagen production. Bringing you the MSM’s skin lightening and brightening properties, Charcoal Diamond: Whitening Soap Bar gives your skin a healthy brighter tone. Activated carbon or charcoal is also known to brighten up the skin. MSM Charcoal Diamond: Whitening Soap Bar thus combines skin brightening properties of both MSM and activated carbon. Tone up your skin a tad brighter with MSM Charcoal Diamond: Whitening Soap Bar! 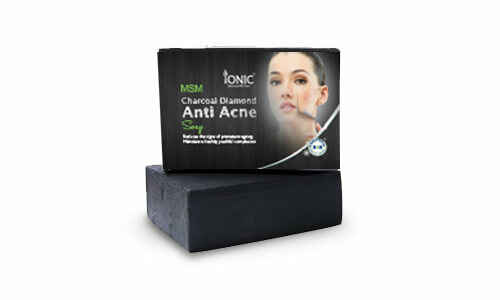 MSM Charcoal Diamond: Anti Acne Soap Bar contains the combined benefits of activated carbon and MSM. Activated charcoal binds with toxins and dirt that leads to acne growth and flushes them. MSM helps the activated carbon reach deep into the skin and act to remove acne. 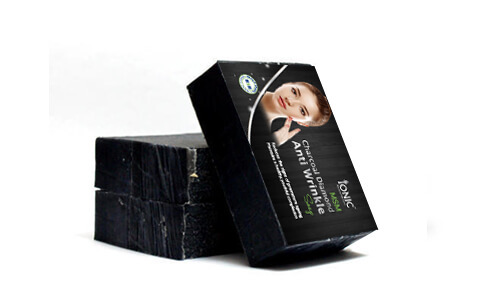 MSM Charcoal Diamond: Anti Acne Soap Bar is the right solution. It contains no chemicals. Just give MSM Charcoal Diamond: Anti Acne Soap Bar a try. We know you will throw out your regular soaps.